Beneath this luxurious leather are the "hands" of a trained massage professional - Ready to provide you with a customized back, leg, and foot massage at the touch of a button. You have to feel it to believe it. Stop by Picard Chiropractic for a free demo and try the chair yourself. Our multi-patent Human Touch Technology® massage system so closely replicates the therapeutic techniques used by back and spinal care professionals that it is the preferred technology of the American College of Chiropractic Orthopedists. It is designed to follow the natural contour of your spine and move three-dimensionally in four different modes. 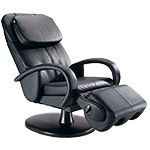 HT-125 does what you tell it, from the ergonomic headrest to the rotating calf and foot massager. You customize each movement to your own preference. The remote controller gives you direct access to three individual pre-programmed massage sessions lasting 15 minutes each. Discover the ultimate in Robotic Massage® wrapped up in a stylish, superior quality exterior that is virtually maintenance free. Feels like strong hands providing a powerful three-dimensional massage for your calves and feet. The calf massage wells will gently hold your legs as the chair reclines to arch your back and engage a gentle body stretching program with an active massage of your lower back.